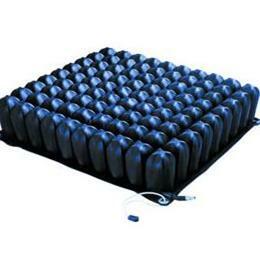 Flexible air cells conform to the body; each cushion is adjustable to achieve a truly personal fit. Therapeutic, stable, portable, lightweight and easy to clean. Aids in the healing of ischemic ulcers. Cushion comes with cover, hand inflation pump, and repair kit. 2-year limited warranty.